In two weeks’ time we’ll be waving goodbye to the white cliffs of Dover, bound for the Norwegian fjords. 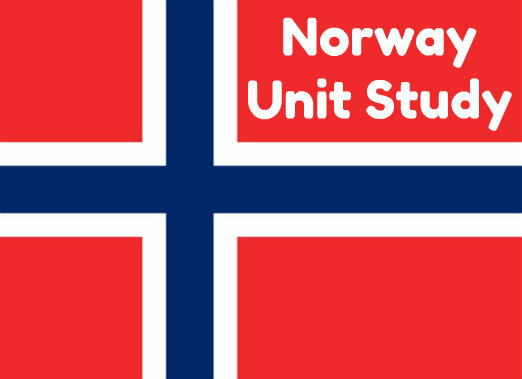 To get the most enjoyment and educational value out of our trip, we’ve been learning a bit about Norway. I printed off a map of the area we’ll be cruising, plus a map from the cruise line showing our complete route from Dover. We also found Norway on our giant map of the world. The children looked at our printed itinerary and located on the map each of the ports we’ll be visiting. 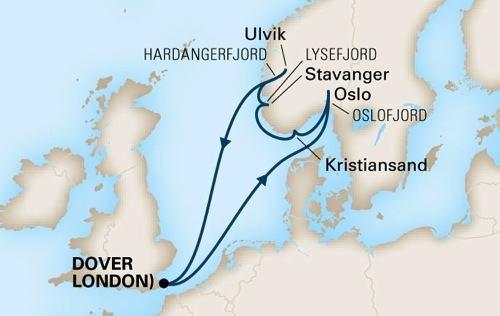 They noticed how far inland Oslo seems, and traced the fjords which connect Norway’s capital city to the sea. I found pictures of each of the ports we’ll be stopping at on Google Images and added text labels using iPiccy, before printing them. For Oslo I also selected a few landmarks we might spot – famous statues, the harbour and the giant ski jump. Edvard Munch’s The Scream is housed in Oslo so I added that to our set of pictures. 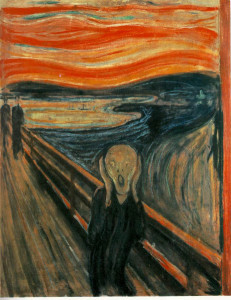 For more on Edvard Munch, see The Tiger Chronicles’ excellent unit, Scream. 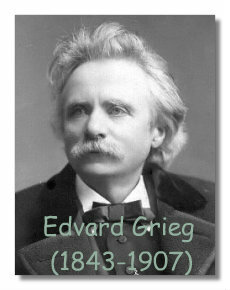 I also added a picture of Norwegian composer Edvard Grieg, whose music – pieces like Solveig’s Song and Peace in the Woods we’ve been enjoying. Here’s a great orchestral version of the famous In the Hall of the Mountain King from Peer Gynt. I say “famous” because it’s one of those pieces of music that’s made it into popular culture such that even I’m familiar with it – and now I know it’s by Grieg! 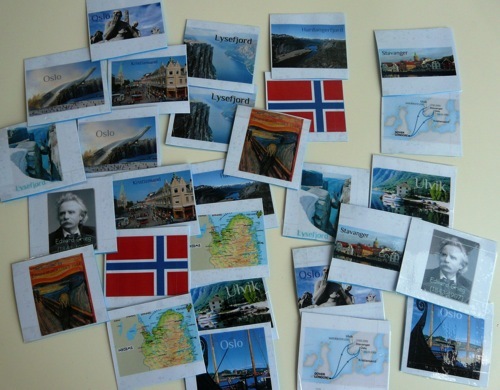 I completed our set of pictures with the Norwegian flag, a map of the area we’re cruising, and the map of our route. 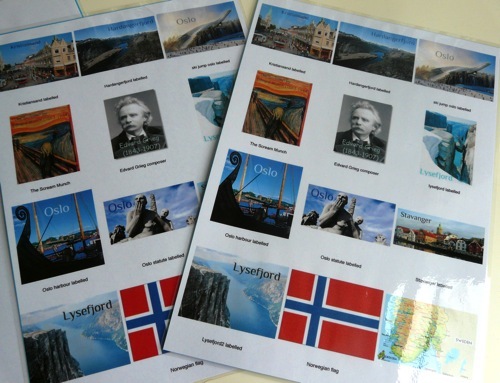 I printed off and laminated two contact sheets of the pictures* and we played memory pairs, which also gave us practice saying and hearing the Norwegian place names. I can’t resist the opportunity to dabble in a new language when I’m about to visit a foreign country. I haven’t done any formal Norwegian with the children but they’ve also enjoyed picking up a few phrases as I’ve been learning. 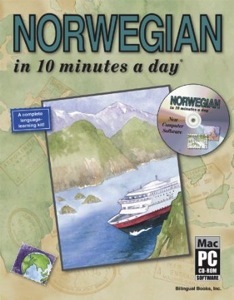 I started out using Norwegian In 10 Minutes A Day which I really enjoyed. It comes with a CD Rom which the children and I had fun with, guessing the rooms in a house or food items in a kitchen, for example. But about halfway through the book I realised I wasn’t getting enough pronunciation practice, so I switched to the free Memrise course Norwegian with Sound for Friends and Family. I’m a huge Memrise fan now! To take away with us I’ve bought a pocket-sized phrase book which comes with a pronunciation CD. I’ve loaded the CD onto my phone and listen at odd moments like when I’m cleaning my teeth. I’m not sure how much I’ll get to use my Norwegian, given we’ll be eating and sleeping on an American cruise ship, but I’m determined to visit at least one cafe and say “Jeg vil ha to kopper te, takk” (“I would like two cups of tea, please”), and perhaps I will ask for directions to the gallery, even though I won’t be able to understand a word of the reply – I can’t even follow English directions! As part of our trip preparations we’ve reviewed what we learned about the Vikings back in September. 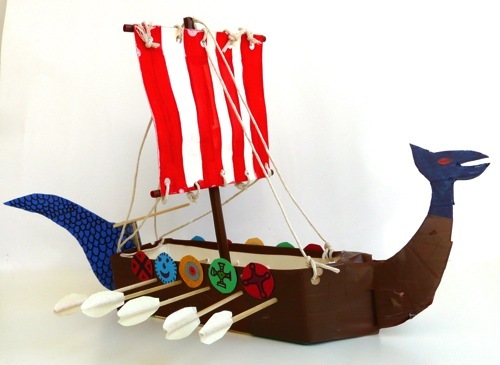 And we’ve finally finished our model Viking ship! It’s made out of a milk carton – for full instructions see here or watch this video. 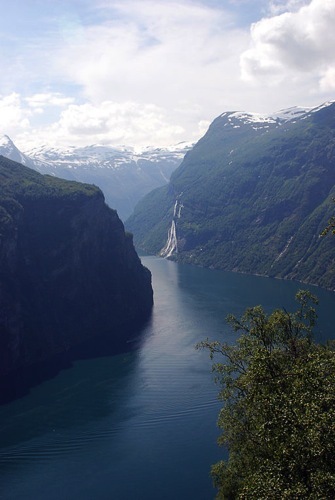 Fjords are found in locations where current or past glaciation extended below current sea level. A fjord is formed when a glacier retreats, after forming its typical U-shaped valley, and the sea level rises to fill the valley floor. This forms a narrow, steep sided inlet (sometimes deeper than 1300 metres) connected to the sea. The terminal moraine pushed down the valley by the glacier is left underwater at the fjord’s entrance, causing the water at the neck of the fjord to be shallower than the main body of the fjord behind it. I showed the children a Brainpop video about glaciers, and some photos of U-shaped valleys. We then made our own mini-glacier to see how glacial plucking changes the landscape as a glacier moves through it. 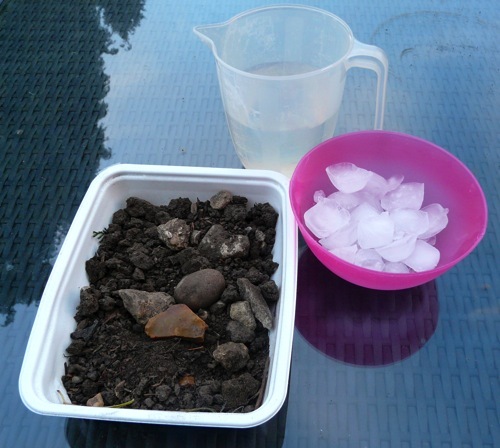 To do this, we put some garden soil in a container, and added some small rocks and pebbles. 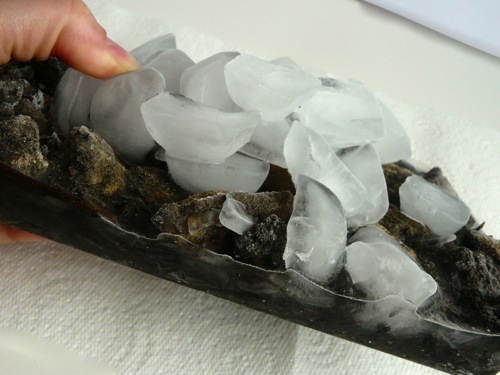 Then we poured in water to represent the glacier’s liquid base layer (caused by pressure), and piled ice cubes on top for the solid glacier. We left the container in the freezer overnight and next day discovered the earth and rocks were completely stuck to the ice! * We talked about how the earth and rocks would be pulled downhill as a real glacier slowly moved. *The instructions we followed said to use an inch of earth and to add enough water to saturate the top layer of earth so that “some pooling occurs”. I wondered if we used too much water because the whole block of earth froze, so we tried it again with less water, but the whole block froze again. We might try it again using a deeper layer of earth, to see if we can achieve the effect of just a few rocks and some of the earth sticking to the “glacier”. C(9) said this was the best science we’d done in ages, though, so it must have served its purpose. We’ll be taking our laminated memory pairs on our trip to use for a scavenger hunt – I’m determined to eke every bit of use out of those hand-crafted cards! Look out in a few weeks for a first hand account of our trip to the Norwegian fjords. Disclosure: This post contains affiliate links. I paid for and use the books mentioned.